Hang seasonal pendant lampsThis star-inspired pendant light adds the perfect finishing touch to a traditional Christmas look. A pendant light, whether lit by a bulb or candle, is a wonderful way to change your room style and add a festive touch to your lighting without having candles on the table. 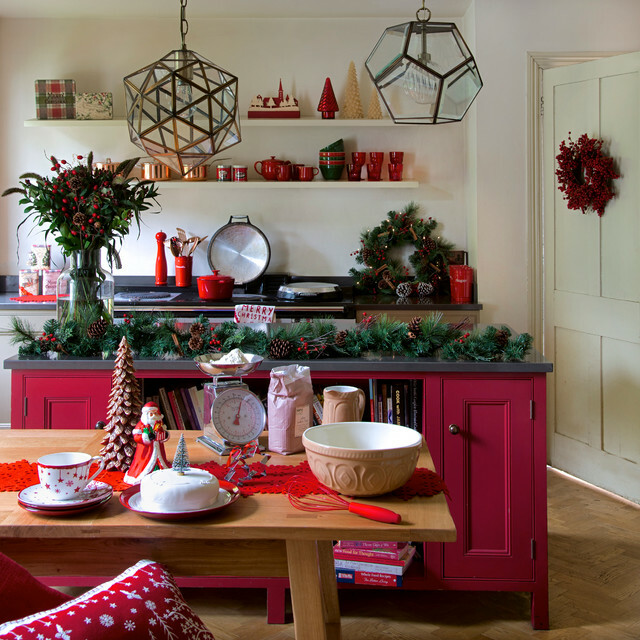 If you have a pendant light over your table, consider swapping the shade to something festive over the holidays, or hang lanterns for a similar effect.TELL US…Do you have a favourite tradition when it comes to your Christmas table setting? Please share your tips and photos in the Comments below. Highlight the boldRed isn’t the easiest colour to live with in a kitchen, but at Christmas, it’s surely a must-have. So if you’ve gone for a plain scheme but splashed colour on a kitchen island, now’s the time to really play it up. That means choosing everything from crackers to candles in a matching hue. Use foliage – whether real or fake – to take it down a notch, add a touch of gold, and you’ve got the perfect Christmas room. Cut down on plastic when prepping foodWhen preparing food ahead of time or to take to another house, store in glass or enamel containers. To keep food fresh, use beeswax wraps rather than clingfilm. Shop for your beeswax wrap here and browse our plastic-free shopping guide to find alternatives for your home this Christmas. Modern loft apartment in Shoreditch.